The city has been using the hotel on Hunters Point Avenue between 38th and 39th streets as a shelter for families since late September. MIDTOWN — The city is still using commercial hotels to house homeless New Yorkers, despite a pledge last year to phase them out following a fatal stabbing at a homeless hotel. The de Blasio administration has said its first priority is to end the use of "cluster housing" as it also opens new stand-alone shelters across the city. In recent weeks, homeless shelters have popped up at hotels in Williamsburg, Sunnyside and Kew Gardens, to the dismay of some neighbors and elected officials who say they were given little warning about the plans. The Department of Homeless Services says the sites are necessary to shelter residents and families who would otherwise have nowhere to go. While Mayor Bill de Blasio has pledged to phase out the use of hotel shelters by 2023, the city is focused first on eliminating its use of "cluster sites" — apartments located in private buildings that the city rents as shelter space — while also opening 90 new homeless shelters citywide in the coming years. "While we are phasing out cluster units as first priority and increasing high-quality borough-based shelter capacity citywide, we are using commercial hotels...as a bridge to provide shelter to homeless New Yorkers, including families with children, who would otherwise be turned out into the street," DHS Spokesman Isaac McGinn told DNAinfo New York last week. The placement of homeless families — who make up 70 percent of shelter residents, according to officials — in private hotels became a major citywide issue after a boyfriend fatally stabbed 26-year-old Rebecca Cutler and her two young children inside a Staten Island Ramada Inn in February 2016. The mayor immediately promised to phase out the use of hotels and NYPD officials said they would increase security over the sites. That summer, some residents of Maspeth, Queens, became enraged after the city planned to convert a Holiday Inn into a shelter. Residents took part in a string of protests, and the hotel owners eventually pulled out of the plan, though city ended up renting out a few dozen rooms instead of taking over the building. While the city says it will cease using hotels as shelters by 2023, the use of new hotel sites has continued: residents in Gowanus, Brooklyn, became upset in August after finding out a Super 8 hotel was housing homeless people. 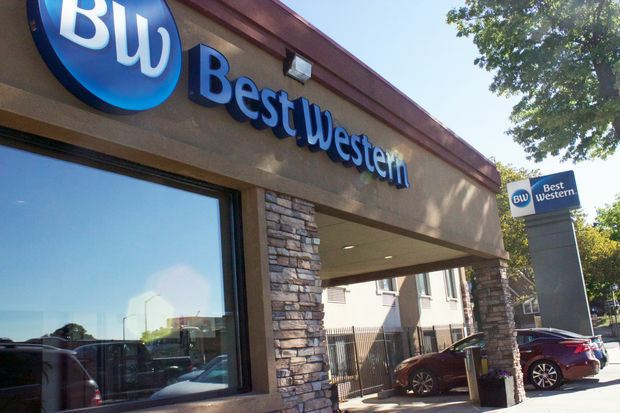 In the last few weeks, the city placed homeless families in dozens of units at a Best Western hotel in Sunnyside, at a 20-story hotel and luxury apartment tower in Kew Gardens and at a former hotel in Williamsburg. The use of hotel rooms as emergency housing has also been criticized because the sites often lack basic amenities like kitchens and can cost the city hundreds of dollars a night. In December 2016, the city was rocked after two homeless infant girls, ages 1 and 2, died when they were fatally burned by a faulty radiator in a city-funded cluster apartment in The Bronx. Several months later, DHS ended contracts with the nonprofit that ran the cluster apartments in the building after DNAinfo reported that the organization had a history of housing-code violations. The mayor released a new plan to combat homelessness about two months later, vowing to open 90 new homeless shelters and phase out the use of cluster apartments by the end of 2021 and commercial hotels by 2023. Since January 2016 — when there was a a high point of 3,600 cluster units in operation across the city — DHS has eliminated more than 1,000 of them at 121 buildings, according to a spokesman. The city also opened five new "high quality" shelter sites earlier this year, with two in The Bronx and three in Brooklyn, according to DHS. Despite the mayor's homeless and housing plans, advocates have complained that the de Blasio administration has not done enough to build affordable units for the New Yorkers who need them the most. The administration has created or preserved more than 77,650 below-market units, but just 11,000 of those are for families making about $25,000 a year, according to a report by the Real Affordability for All Coalition released last month. The city also announced a new pilot program in late September to provide up to 12 months in rent for some homeless families willing to relocate out of the five boroughs. “For decades, the City has helped our homeless neighbors seek housing where they can best get back on their feet—sometimes that includes outside the five boroughs,” a DHS spokesman said about the program, which is an extension of the Bloomberg-era Project Reconnect. DHS officials said the administration has helped more than 64,000 New Yorkers leave or avoid the shelter system since de Blasio came into office. The mayor’s office did not immediately respond to a request for up-to-date numbers on the phase-out of hotels as shelter sites.